This is a nice italian game that is unfortunately quite hard to find and therefore tends to fetch high prices on the web (specially since italian sellers generally overprice everything). I did not want to increase the game's price until I secured a copy for myself, so I did not include it on the site with a red dot (which marks games I do not have) although I had already photographed the game. As you probably know, things that appear on the web, specially if they are well photographed and displayed, may increase their price as collectables, or at least some sellers may think so. It is stupid but that is the way it is . Anyway, thanks to my friend François, now I have a copy in my collection, and now I can finally include this game in my site. 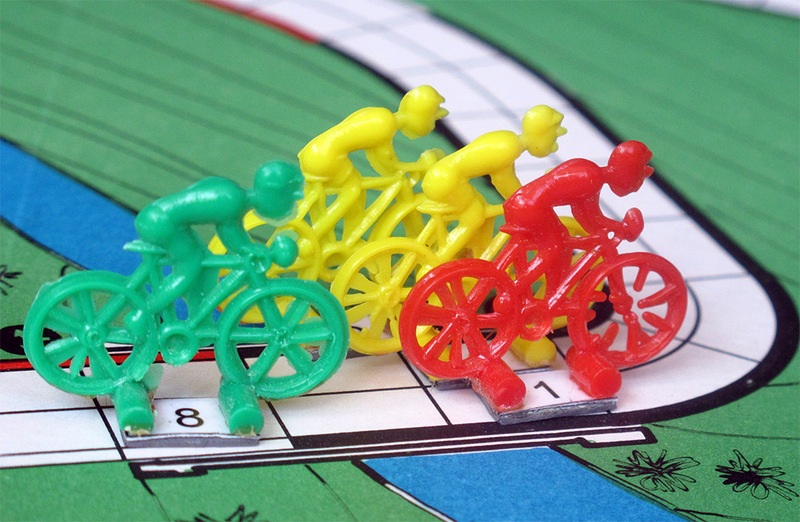 The game is what I call "an ambitious game", one that wants to represen as many aspects of cycling races as possible. 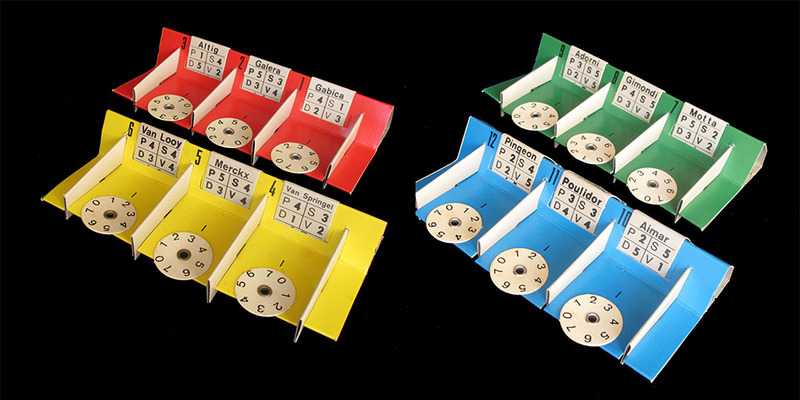 It is meant to represent a stage races, with classification by time and/or by points, but it also can be used to play a single one-day race. We find different types of terrains and all riders have different abilities. The rules are trilingual (Italian, French and German). I would generally assume that, the game being Italian, in case of doubt the Italian rules should be the original. However, in the case of this game I am not so sure, since there are some inconsistencies in the italian rules (see below). The problem is that the French translation is also problematic (it is clearly a translation, the idioms are sometimes wrong, and it mentions a "course contre la montre" which is clearly a mistranslation), and my knowledge of German is not good enough to determine if the rules are correct. The board is big enough: it measures 59.5 x 42 cms (while the box measures 44 x 31 x 4 cms). 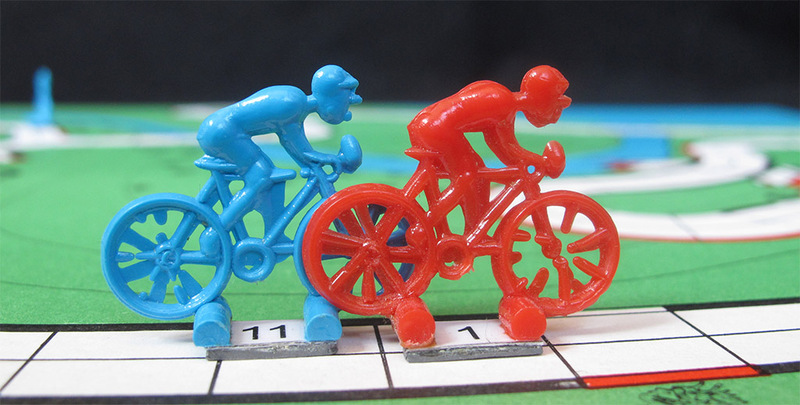 It offers different starting and finish points, so different races can be run on the same board. The type of terrain is determined by the color on the right (in the sense of the race, of course) margin of the road: black means a flat road and it consts three points to move though it, red means a climb and it costs 4 points, and black means descent, which is easier to ride and just costs 2 points. Furthermore, the circles marked with a V determine the sprint zones, which are not necessarily flat. As you can see, there are three small riders (measuring 29 mm) in each team. Each of these riders has different abilities. According to the italian rules, riders abilities are P=Pianura (flat road), S=Salita (climb), D=Discesa (descent) and V=fondo (endurance). Of course V for "fondo" is a weird choice... specially if you compare to the French and German rules, that have 5 different values for each rider. By a design feature, the fifth abilitiy tends to be hidden. Check for instance Motta in the picture above and you will clearly see the fifth value below the others. So, as correctly stated in the French and German rules, V is for sprint ("Velocità") and "f" is for "fondo". The "f" value is marked by the wheel position at the beginning of the race. If your rider has f=6, like Motta in the picture above, the race will start with its counter at 6, and this value will decrease during the race. The other abilities do not decrease during the race, and are added to the value thrown with the dice depending of the type of terrain. Some extra points are also added to the throw if the rider is protected from the wind (behind another rider). But this total sum is not the value by which the riders move, since different types of terrain need different values to move throuh them. By the way, players choose whether they throw with one or two dice. They may even chose to throw the three dice, but then they lose an endurance point. I would guess that throwing with just one die would give you back an endurance point, but it does not say so in the rules. The only interest of throwing just one die would be, then, to avoid the risk of throwing two ones (which causes a puncture). The plastic injection did not reach all the wheel spokes. However, although you appreciate it clearly in this picture, you do not really mind with a 29 mm rider. Though the teams are named after countries (in this case Italy, Belgium, France and Spain), the riders do not exactly match these countries. 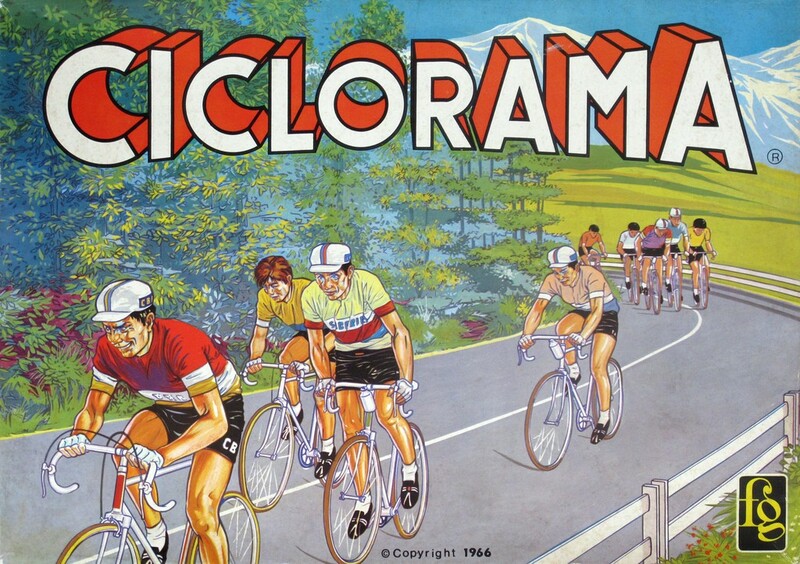 We find three italians (Adorni, Gimondi and Motta), three frenchmen (Aimar, Pingeon, Poulidor), three belgians (Merckx, Van Looy, Van Springel), two spaniards (Gabica and Galera) and a german (Altig). One might think that the teams are national teams and that the Spanish team has been strengthened with a German rider. Nothing is further from the truth. 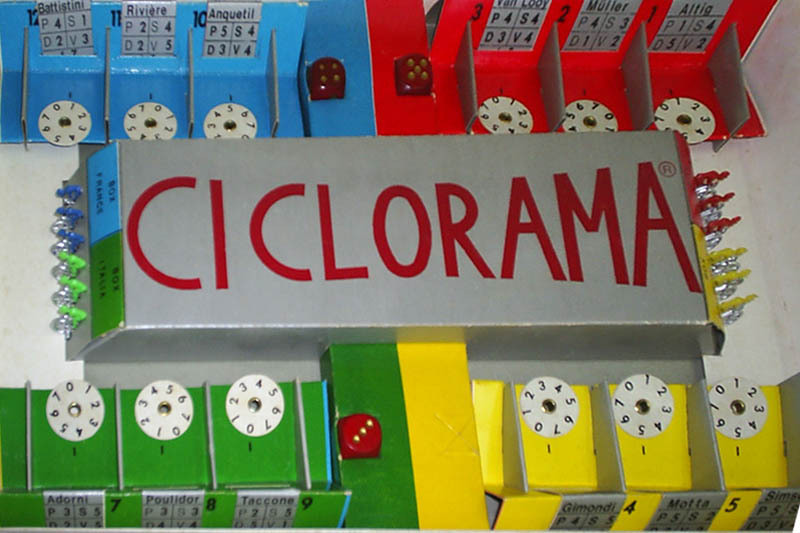 The fact is that before the start of the race the players draw by lot who has the right to chose first , and players select their riders according to their values and the kind of race the they are going to play, and not of their nationalities. 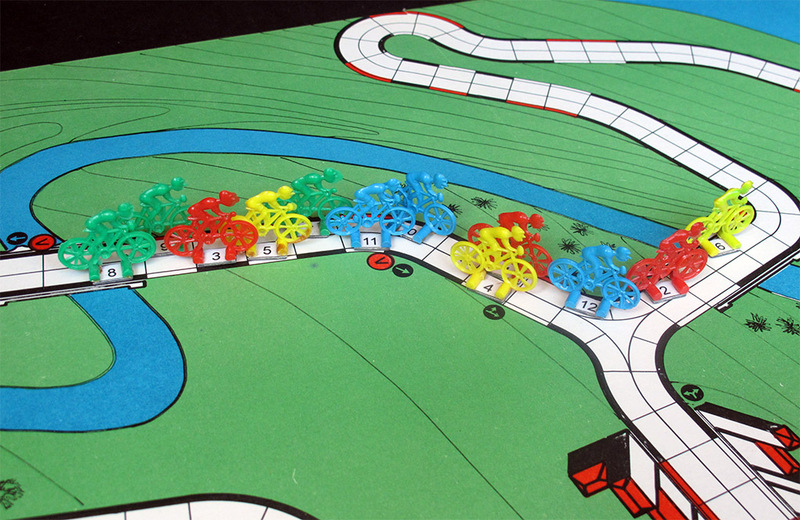 There is another version of the game (see below) in which the distribution of riders by nations is less balanced. 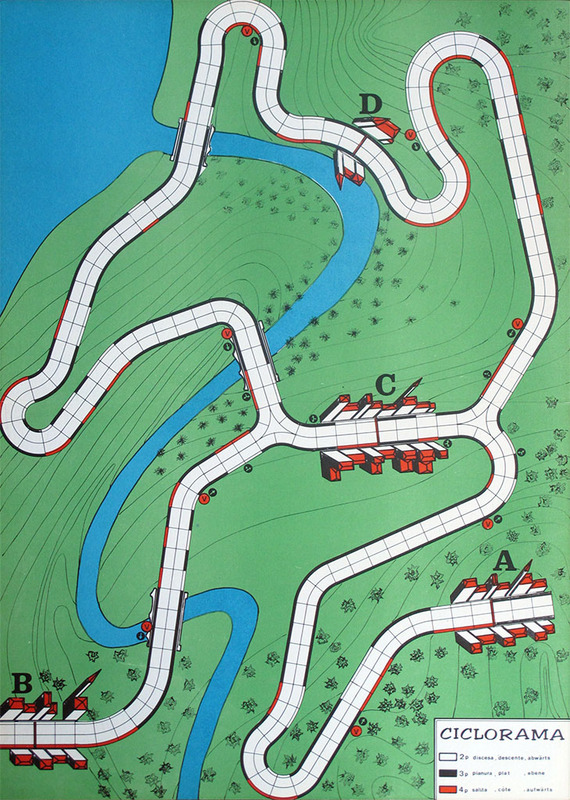 This game was copyrighted in 1966, as cleary seen on the game cover. 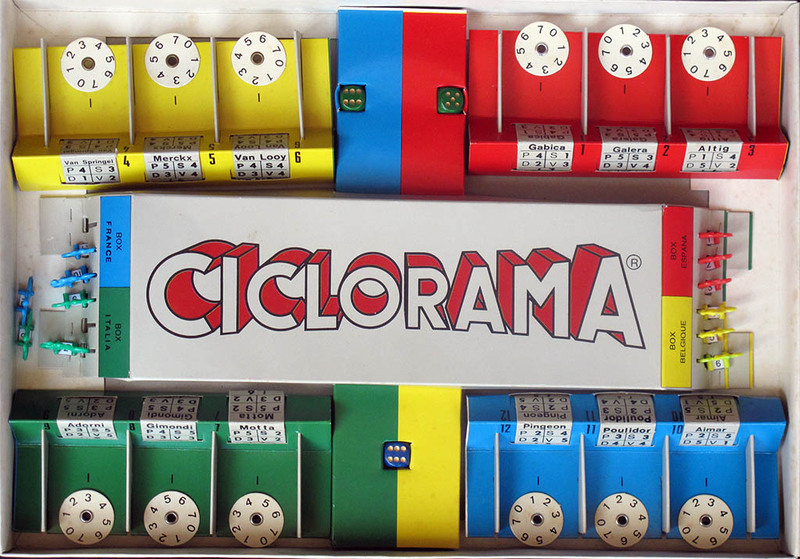 However, the presence of certain riders like Merckx, Gimondi, Aimar, Gabica, and specially of Roger Pingeon (winner of the Tour de France in 1967) makes me think that this game was made one or two years later. This would not be too much of a surprise. The date of copyright is not exactly the date of production, and minor details like the composition of the peloton can change in the meanwhile. As a side note, let me show my surprise with the selection of spanish riders. 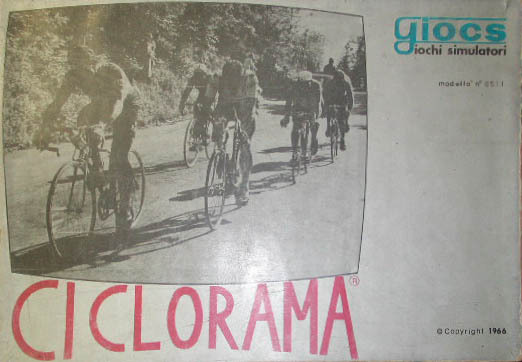 Who remembers Galera (who won a Tour de France stage in 1965) or even Gabica (who nevertheless won th Vuelta in 1966, plus a Giro stage the following year)? It is strange not to have at least Julio Jiménez, who has a much better palmares and was much better known at the time. As far as I know the contents of the game are similar, but the team and rider selection is different. In this case the teams are named France, Italia, Deutschland and England (which, by the way), suits better the languages in which the rules are offered, and the riders are Anquetil, Poulidor, Riviere, Adorni, Taccone, Battistini, Gimondi, Motta, Simsons (sic), Van Looy, Müller and Altig. This makes 5 italians, 3 frenchmen, 2 germans, 1 belgian and 1 englisman. 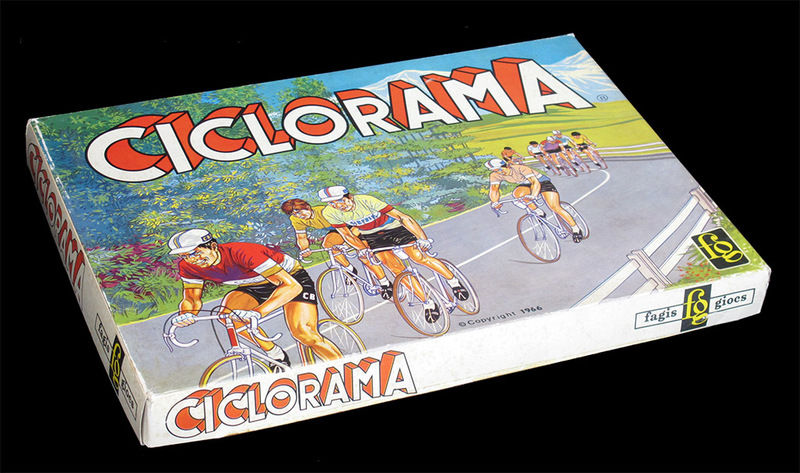 If I the presence of certain riders in the other box made me think that the game was of, at least, 1967, the presence of the late Tom Simpson indicates that this version was not made after the Tour of 1967. To put it simply, we have Anquetil in this version and Eddy Merckx in the other.It is thus clear which one was made first. Possibly the first version was actually made in 1966, and the one I have may have been published one or two years later. Thanks to François Cardinet for this game.